So, today I started a little project. Or is it better to call it a journey? A journey through one of the most unpleasant months of the year to a beautiful Christmas tree... I like how it sounds. First of all I found a box at home. It even looked like a Christmas box which is ideal. Hopefully in 30 days this box will be full and I will be really proud of myself. Then I searched for some patterns and inspiration. 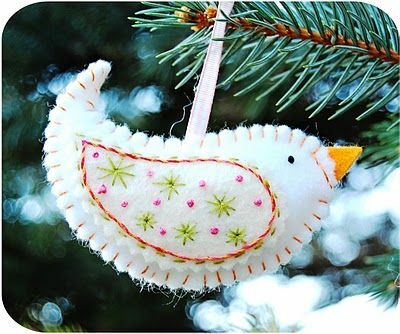 I decided that I won't be supertraditional and really anything as long as I like it and it has appropriate size can be a Christmas decoration. It can be bunnies or any other animals, snowmen, little houses, hearts, apples, angels or any other dolls, balls, trees and so far. The best places to search for inspiration are Pinterest (look at my "Christmas decoration ideas" board there), Google images, any craft magazines like Mollie Makes... There are lots of great ideas in the Internet using all kinds of materials and any skill levels, the most important part here is the creativity. Now shall we start with the first Christmas tree ornament I made. Today the weather was awful, cold windy and rainy and I could sit in my living room and hear that rain and wind outside. Probably that's why I wanted a bit of romance and choose a little crocheted heart by Taube Skywalker as a first project. Ok, that is how I did it (not totally followed the instructions, but who cares after all). First of all you need some DK yarn (about 200 m in 100g), a bit of stuffing and a 3mm crochet hook. 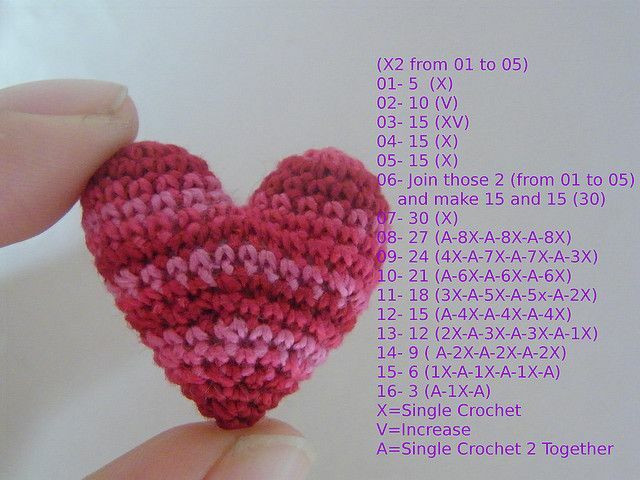 When I made the solid colour heart I was crocheting in spiral, so no slipstitches in the end of each round were needed, but when I made the stripy heart I was working by rows and each row started with ch1 (I didn't count it as a first dc), dc into the same space, and ended with slipstitch. First top done! Cut the yarn leaving a tail and make the second top using the same instructions, just don't cut the yarn in the end. Now we'll need to join these tops together. Round 16: crochet every two dc of the previous round together = 3 dc (I found this round most annoying and difficult as it is not actually that easy to pull the hook through the last two dc). Now cut the yarn leaving an end, hide that end using either your crochet hook or a tapestry needle and you're done! And I should make normal daylight pictures of the hearts tomorrow.